AUCTIONEERS NOTE: Many more firearms expected by sale date. 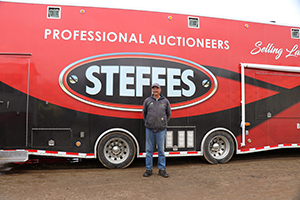 FIREARMS TERMS: Steffes Group Inc. will require all successful bidders who do not possess an FFL to complete Form 4473 and pass an FBI NICS background check. A $25 transfer fee per Form 4473 will apply. Shipping available only to FFL holders. Shipping cost that will apply are for the box, shipping supplies & actual shipping costs through FedEx. Live online bidding is available. On-Site Buyer's premium of 10% applies to all purchases. Internet Buyer's Premium is 10% plus 2%, capped at $500 per item. All items sold as is where is. Payment of cash or check must be made sale day before removal of items. Statements made auction day take precedence over all advertising.